The electronic throttle control system (etcs) controls the engine idling speed. The etcs operates the throttle actuator to open and close the throttle valve, and adjusts the intake air amount to achieve the target idling speed. In addition, the ecm retards the ignition timing and the etcs increases the intake air amount to quickly increase the catalyst temperature at cold start to reduce emissions. The ecm monitors the intake air amount during idling and the ignition timing. When the engine coolant temperature (ect) is between -10°c and 50 °c (14°f and 122°f), the ecm calculates the idling intake air amount for 10 seconds, beginning 3 seconds after the engine starts. When the accumulated value is below the threshold, the ecm interprets this as a malfunction in the idle speed control (isc) system at cold start. The ecm also monitors the ignition timing at cold start, and judges it to be incorrect when it is advanced to the same value for a warm engine for 5 seconds or more of the 10 second monitoring period. P050a is detected when all conditions below are met (2 trip detection logic). 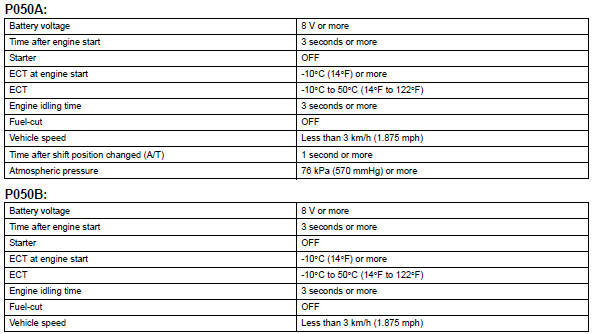 The ect is between -10°c and 50 °c (14°f and 122°f) when the engine starts. The engine idles for 13 seconds after engine start. The accumulated intake air amount is below the threshold. The ecm sets the dtc and illuminates the mil 13 seconds after the engine is next started. When the negative battery terminal is disconnected during inspection or repairs, the isc learning values are cleared. 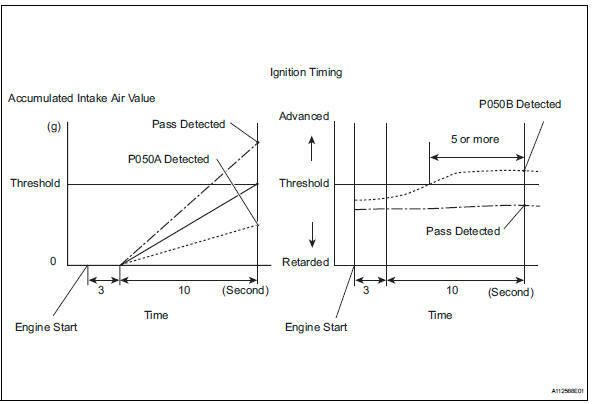 The isc learning must be performed by warming up the engine and idling for 5 minutes with the ect at 75°c (167°f) or more because dtcs cannot be detected with the isc learning values cleared. Select the following menu items: diagnosis / enhanced obd ii / data list / primary / short ft #1 and long ft #1. Add together the short ft #1 and long ft #1 values to obtain the total fuel trim. Ok: total of short ft #1 and long ft #1 values is between -20 % and 20 %. Check the engine speed while operating the oil control valve (ocv) using the tester. Visually check that the air cleaner filter element is not excessively contaminated with dirt or oil. Ok: air cleaner filter element is not excessively contaminated with dirt or oil. Check for deposits around the throttle valve and throttle valve condition. Ok: no deposits around throttle valve and throttle valve moves smoothly. Start the engine to idle for a minute.